The Consultative Group (CG) for Vietnam, and Vietnam Business Forum (VBF), will convene mid-year to examine the problems and opportunities posed by development. 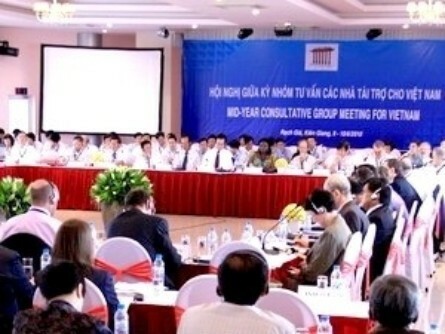 The Consultative Group (CG) for Vietnam will hold its mid-year meeting in Ha Tinh City, in central Ha Tinh Province on June 9. The meeting will focus on four major topics including re-establishing and maintaining economic stability, protecting the poor from economic instability, addressing issues from the Anti-Corruption Dialogue, examining the issues brought up at the Aid Effectiveness Forum. Prior to the CG meeting, a separate Vietnam Business Forum (VBF) - a structured and on-going dialogue between the Vietnamese Government and the business community - will be held in Hanoi on May 27. International Finance Corporation (IFC), member of the World Bank Group, in coordination with the Ministry of Planning and Investment will organise the VBF. The mid-year Vietnam Business Forum will be dedicated to the topics such as perception of the domestic investment climate, banking and capital markets, infrastructure, education, and reports from other Working Groups. As part of the programme, three trips have been arranged for June 8 to review projects like Ke Go Irrigation Project, improvement of market participation of in Khanh Loc commune, an urban environmental and improvement project in Ha Tinh City. The Vietnamese-German Vocational School and Provincial Hospital in Ha Tinh City, Provincial Road No. 28 along with Tran Phu and Phan Dinh Phung Memorial Areas will be also reviewed. During CG 2010, donors made a commitment to support such development projects with pledges equal to about USD7.9 billion.